Simply plug the network adapter into the USB-C port on your laptop and connect to your network. The adapter's Realtek® RTL8153 chipset provides native driver support in Chrome OS™ and Windows®. 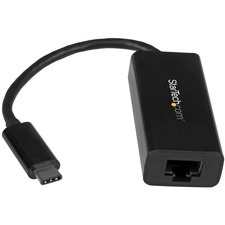 This portable USB Gigabit network adapter is the ideal desktop network adapter or laptop accessory for those who require more portability. It's powered directly from the USB port making it easy to connect when you're on the go.